Bond started to tell S. about some of the things he’d seen on the exhibition floor and what things he’d heard people talking about in the corridors. S. didn’t want his opinons, though, just the facts. So Bond used his super-memory to tell S. about the technologies that he’d seen: apparently, NFC and tokenisation are all the rage, and improved “onboarding” (Bond wasn’t entirely sure what that meant) is the next big thing. There was also a lot of talk about financial inclusion, and this had a lot to do with mobile phones. When Bond returned to his room, he found an envelope pushed under the door. He opened it carefully, and found two photographs inside. They looked as if they’d been taken by a long lens looking through a window. The first showed @dgwbirch looking at some sort of chart that seemed to be something to do with tokenisation. 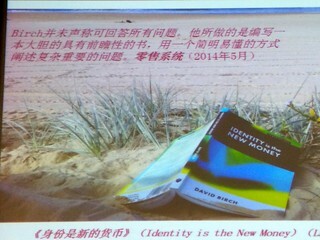 The second seemed to be something to do with that indispensable handbook on the future of the industry, “Identity is the New Money“. But what did they mean? And who had put them under his door? Clearly, someone wanted Bond to know that @dgwbirch was in this payments business up to his neck. Someone was telling Bond that @dgwbirch’s stupid tweets about South West Trains were just a front and the blind the scenes he was somehow involved in the really cool stuff going on in the payments world. This, Bond thought, was where the service should focus their efforts. 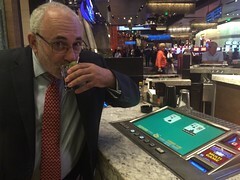 Not only on @dgwbirch, but on the brains behind his operation back at CHYP End. G. wanted a full report, together with detailed expenses claims and receipts, so Bond went off to see her. He finished by telling her his most important conclusion, the one he’d saved for last. Fair enough, Bond was think as S. went through the options. Bond walked back to the bar. So it was true. The mobile wallet did exist, and A.P.P.L.E had snatched it from under the noses of M.C.X. The Cold War was over, and the Phoney War was about to begin. Bond grabbed the gin and tonic and let the magic liquid do its work. Then he stood, turned, and walked out of the casino, blinking into the lunchtime sun. He waited in the taxi line, glancing at the boarding pass for Seattle on his phone. One day it will all settle down in the payments world, he thought, and no-one will need consultants any more. One day, he hoped, there would be peace. Just not yet. See you all at Money2020 next year.